The Federal Capital Territory (FCT) Minister, Malam Muhammad Musa Bello, has pledged to work with the Defence Headquarters Garrison, as well as other security agencies in the FCT towards effective maintenance of peace and security in the Territory. Malam Bello gave this assurances while welcoming the newly posted Commander of Defence Headquarters Garrison, Brig. Gen. Olubunmi Irefin, when the latter paid him a courtesy call recently. The Minister acknowledged the support and hard work of officers and men of the Defence Headquarters Garrison, Abuja over the years in the efforts to maintain law and order in the Territory. He also underscored the contributions of other security agencies both military and paramilitary outfits in this endeavour. Bello congratulated Brig. Gen. Irefin for the new and important command position he has been assigned to. He described the posting as an eloquent testimony of Brig. Gen. Irefin’s meritorious services, sound academic background and command positions he has held both within Nigeria and outside, especially during international peace keeping operations. 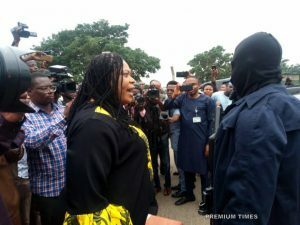 This, the Minister noted, has adequately prepared the new Commander for his present assignment. 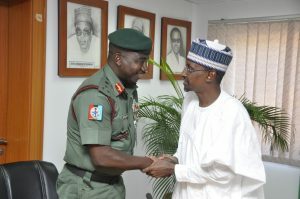 The FCT Minister pledged to continue to be good host to the Garrison and prayed that God may continue to propel the new Commander to positions of higher responsibilities. Earlier in his remarks, Brig. Gen Olubunmi Irefin noted that his visit was to inform the FCT Administration that he has officially assumed command at the Defence Headquarters Garrison, Abuja. He stated that the he took over on the 1st of August, 2018. Brig. Gen. Irefin disclosed that he has been briefed by his predecessor on the good efforts the FCT Minister is making to fast track the development of the city. He pledged to work to sustain the existing record of excellent performance. In a brief citation on him by the Garrison PRO, Major Rose Managbe at the occasion, functionaries present were let into the impressive credentials of the new Commander which include; attending various military courses both at home and abroad, such as Regimental Signals Course, Amphibious Operations and National War College Washington DC courses. Brig. Gen Irefin has also held various appointments such as Platoon Commander, Intelligence Officer, Directing Staff of Armed Forces Command and Staff College, Commanding Officer – Nigeria Battalion – United Nation’s Mission in Dafur as well as Chief Instructor, Armed Forces Command and Staff College among others. He also served in both Liberia and Sierra Leone under the Ecowas Military Observer Group (ECOMOG).